Do you hide your smile because of chipped, cracked, stained, or slightly rotated teeth? Veneers at Integrative Dental Care offer a great option if you want conservative cosmetic treatment to enhance your smile for many years. 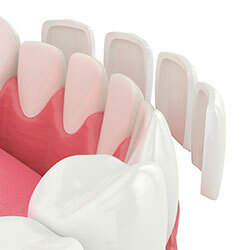 Veneers are thin, custom-made shells made from tooth-colored porcelain, designed to cover the front side of your teeth. They are the least invasive, most permanent, and most aesthetic option to achieve a beautiful and healthy smile.